I don't know about you but this year seems to be evaporating before my very eyes! We're already almost a quarter of the way through 2011 for goodness sakes. I've been wanting to share a story with you and I'm realizing it happened almost one month ago. Lame. Anyway, my friend Karen and I hosted the Oscar Night of Gluttony banquet again, which is I think now officially an annual event. Here's how it works: We each draw three of the Best Picture nominations out of a hat and have to make a dish or a drink inspired by the movie. We then proceed to eat ridiculous amounts of food for hours as we make catty comments about the fashion, acceptance speeches and celebrities. 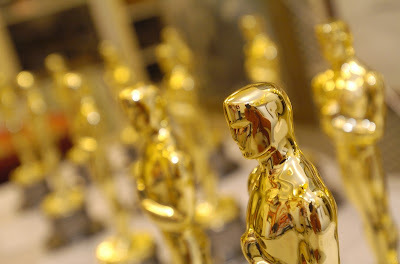 Since the Oscars is a live show, things get started around 3 pm in California. This is great because for whatever reason I love to drink during the day. [Note: I hope none of my clients are reading this post.] It makes me feel like I'm on a mini vacation or something. By 9 pm we're pretty drunk and definitely stuffed. The only major downside is that my photography skills degrade with each glass, so the quality of these pictures is pretty poor. Sorry about that. The menu this year was quite impressive, if not also a bit random given the range of movie themes. Karen drew The King's Speech, Black Swan and 127 Hours. Those who know me know I have a strange sense of humor so I thought it would be funny to not bring anything for 127 Hours. I mean after all the main character was pinned by a boulder for 127 hours so there was not a lot of food going on in that movie. But Karen thankfully does not share my humor and did actually make a dish for it: homemade hummus and crudite. It was also the only healthy thing we ate that day. And a rich seafood risotto that played off the black and white theme in The Black Swan — which was a recipe that incidentally came from the Black Swan restaurant in Orlando, FL. 1) Winter's Bone: While crystal meth is central to this movie, I figured it was better to go with something a little more legal so served up zinfandel-brasied beef short ribs served over rosemary-parsnip potatoes to play off the concept of bones and a comforting Winter dish. 2) The Social Network: I was torn between the typical college fare of pizza, top ramen and mac and cheese. Ultimately I went with homemade cookies because I remember getting those care packages filled with cookies in the mail while in college. It was like gold. I could trade them for all sorts of things: a load of laundry, borrowing someone's car, beer, etc. 3) True Grit: It may have been too obvious but I couldn't resist shrimp and grits for this Western remake. I actually have an entire cookbook dedicated to the subject of shrimp and grits and labored the longest over which version to make. A key ingredient was a can of Coke so you know I was convinced I found a winner. As predicted, a lot of the Golden Globe winners walked away with the Academy Award . . . and I gained about 10 lbs in a single sitting. But I'm already looking forward to next year's indulgent event. P.S. I'll share posts for some of the other recipes in the coming week, so stay tuned! Pour first two ingredients into a champagne flute and top with sparkling wine. Sip and enjoy! Once again a blog post that made me laugh and also hungry :-) Looking forward to trying your grits sometime Hols. I LOVE your blog! Our stories are fairly similar. I also grew up in the deep South and would never want to stray too far from my Southern roots! I have lived in California, Arizona, Chicago, Tamp, you name it... and somehow I always end up back home. The South has such a love affair with food and I LOVE it! On a side note, I saw where your grandmother's name is Monk. That is my aunt's name. Not too common, is it? Wow all your food looks so delicious. There is nothing wrong with a little southern hospitality, no matter what part of the country you now call home! There is no better place then Santa Babrara, that town is full of culture and there is never too much. I was in town several months ago enjoy the rich cuisine as well as the sights of this town and I cannot wait to go back! There is so much more I want to do. Hiking for one! I hear there are a ton of good trails working looking into. I'm stoked! I'll be staying at the Sandman Inn (www.thesandmaninn.com). So affordable and the downtown is a stone throw away. Someone had a off the charts Oscar party! That is so the way to do it. My girls and I in college used to do all this stuff all the time. I really miss it! VMA parties were always the best! This is all in Santa Barbara too which makes it ten times better. OUtdoor parties especially, the weather is always so perfect for stuff like that! I'll have to plan a trip to go back to Goleta and Santa Barbara and see some friends, it's been way too long! I'll probably stay at the South Coast Inn (www.goleta-hotel.com). Elegant and quaint. Really can't skip out on that.